The most well-known argument for vegetarianism is the ethical problem of eating another living being. However, that is not the sole reason people should lean towards vegetarianism. Frankly, to most people it is an unconvincing argument, which is completely fair. It often seems that this is the only argument that vegetarians/vegans have for their diet choices. Americans eat meat, because culturally that is what we know. The argument needs more substance, especially when in the U.S.A. there are a lot of people unable to feed themselves without fast food, which is largely meat-based. Having access to limited options is something that I can overcome easily because I am privileged enough to have the time and money to cook for myself. So of course, if you brought that argument against someone who has no money, even if they see your point, they could not actually do anything about it. I am vegetarian because of the negative impact that continuous meat consumption has on the environment. In hunter-gatherer societies, where meat was hunted and immediately consumed, there was nothing unsustainable about eating it. The problem now is that agriculture has to sustain the entire human population, which makes it impossible for everyone to have what they want without massive waste and pollution. 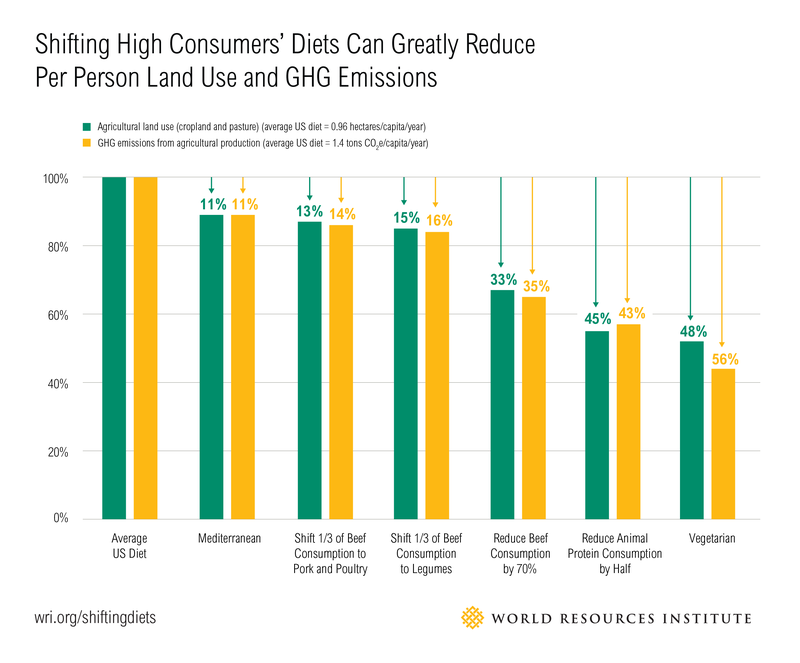 Removing meat from the United State’s population’s diet would reduce greenhouse gasses by 2.6 percent. While I am a single member of the United States whose impact is minimal at best, I still remain a vegetarian primarily for this reason. The only way to fix this problem is through a collection of people changing their lifestyles in some way that affects change. These incremental changes add up. Recently, Sonic restaurants have started supplementing their beef patties with mushrooms, making the patties 25 percent mushroom. This small change in a single burger is very small, but Sonic has 3,615 locations nationwide. With a chain that big, doing so will be very impactful on the environment. Every store producing hundreds of burgers every day means that the slight change to the patty itself will cause huge changes in how Sonic affects the environment. If 30 percent of burgers were replaced with mushrooms, we could reduce the amount of greenhouse emissions by the same amount as removing 2.3 million cars off the road. This is how I view my vegetarianism: it is not about the change I bring about as an individual; it is about the collective that actually has the power to lower our consumption. I hope that I can convince people to reduce their meat consumption by just a little bit. We do not need to give up meat entirely. In fact, I think that it is far more helpful to have a reduced-meat diet. It may not be the most efficient for an individual to help, but it still adds up. If even a small segment of the population is vegetarian, then that is still way better than no one being vegetarian. I know that the reduction of an incredibly small fraction of 2.6 percent of greenhouse gasses seems insignificant. But any reduction is still a reduction, right? Helping how you can is still important, which is why I believe that vegetarianism without being politically active on behalf of the environment is insufficient. Global industry accounts for 21 percent of greenhouse gas emissions. If you stop eating meat, or eat less meat, you should also vote for people that want to benefit the environment and limit emissions. The problem with vegetarianism is that the emotional arguments are usually the only ones that people address. Emotional arguments do not address facts, so people who do not do research assume that vegetarians are primarily concerned with emotions. Granted, many are, and that is not a bad thing. Even if you do not care about fluffy animals, think about the future and regulate your meat consumption’s impact on the environment.